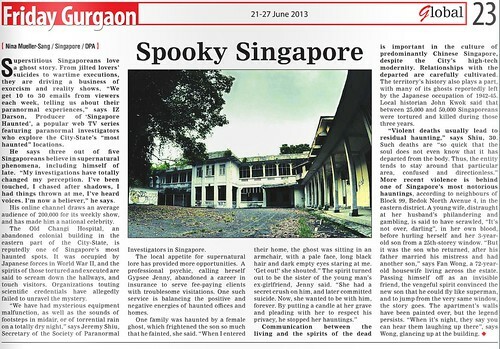 A fan from India sent me a newspaper article about me and my show Singapore Haunted (Do like us on Facebook). I remember giving an interview to the reporter 2 years ago but I never did get to read the finished story. Here's the article 2 years late but I'm very touched that the fan still sent it to me. 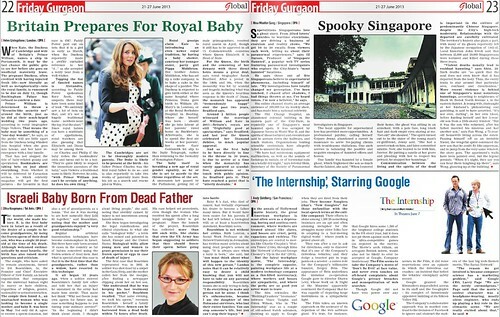 Superstitious Singaporeans love a ghost story. From jilted lovers’ suicides to wartime executions, they are driving a business of exorcism and reality shows. “We get 10 to 30 emails from viewers each week, telling us about their paranormal experiences,” says IZ Darson, Producer of ‘Singapore Haunted’, a popular web TV series featuring paranormal investigators who explore the City-State’s “most haunted” locations. He says three out of five Singaporeans believe in supernatural phenomena, including himself of late. “My investigations have totally changed my perception. I’ve been touched, I chased after shadows, I had things thrown at me, I’ve heard voices. I’m now a believer,” he says. His online channel draws an average audience of 200,000 for its weekly show, and has made him a national celebrity.